I have a folder on the main screen of my smartphone with a folder called Messaging. In the picture to the left, you can see which apps I have in this folder. In an attempt to reduce how many apps I use to send messages, I combined my regular texting with Google Hangouts. Each of these apps have great features within them, but having this many apps seems somewhat excessive. At the same time, I communicate with different people on all of them, so they're necessary to keep installed on my phone. WhatsApp and Facebook Messenger are both owned by Facebook (FB). These apps are pretty much becoming the same thing. I love Whatsapp. It is quick and lightweight. It is so easy to use and set up on your smartphone. After a year of use, you have to pay for the app, but it's not expensive. The only bad thing is that I don't have many friends that use Whatsapp. Everyone seems to be on Facebook Messenger. 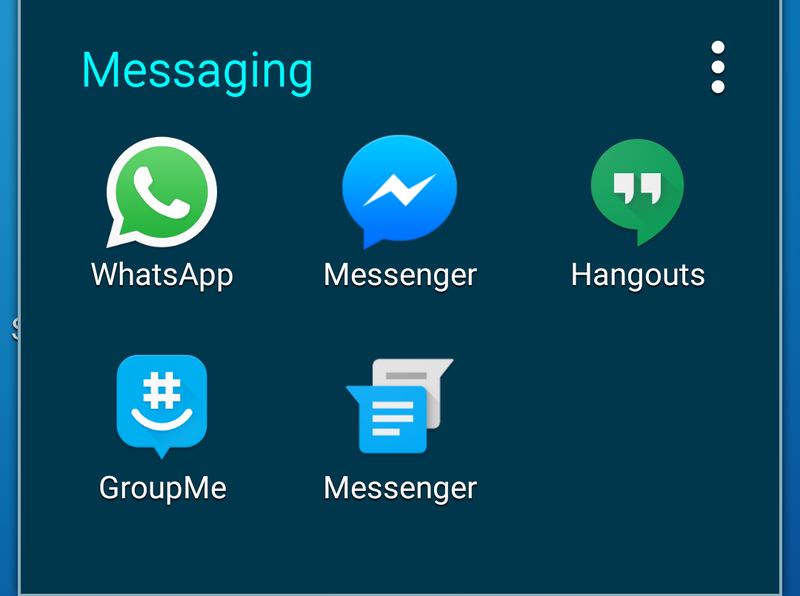 A the time of writing this, Facebook Messenger is the top free app on the Play Store. A lot of my friends only have Whatsapp because they studied abroad during college and wanted a free way to communicate back home. Google Hangouts is great because I can talk to someone on my phone, and when I log into my Chromebook, I can continue the conversation. The same could be said for Facebook Messenger, you can continue conversations while logged into Facebook. GroupMe is decent. I used it about it 4 years ago and I'm using it again. Back 4 years ago, I thought it was a pretty cool app, but I think it missed it's chance of becoming super popular. Part of it isn't GroupMe's fault, because Facebook Messenger got its users from having a huge social media site first. 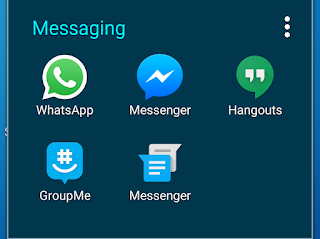 I could have the same group chats on WhatsApp, Facebook Messenger, or Google Hangouts. Like I mentioned earlier, having this many apps seems excessive. I'm not sure right now I can get rid of any apps because there's specific people I communicate with on each one. I will be looking into consolidating how I communicate with friends and family on my phone. I will let you know when I have an update!